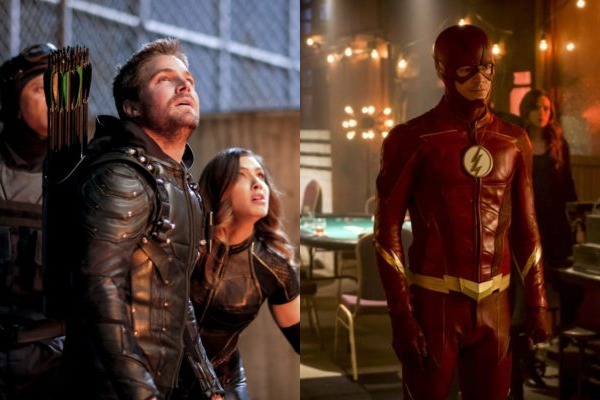 This week has been a jam-packed week for our heroes within the Arrowverse. You already saw our recap of Supergirl where Kara and the DEO took on the “Trinity” of the World Killers. Although they were able to take on and seemingly defeat Pestilence and Purity, all the World Killers powers were absorbed into Reign, meaning they are not out of the woods yet (recap here). However, there are still threats that Barry and Team Flash has to take care of on The Flash, as well as Oliver and Team Arrow needing to “save the city” on Arrow. So how did this week in the Arrowverse go? 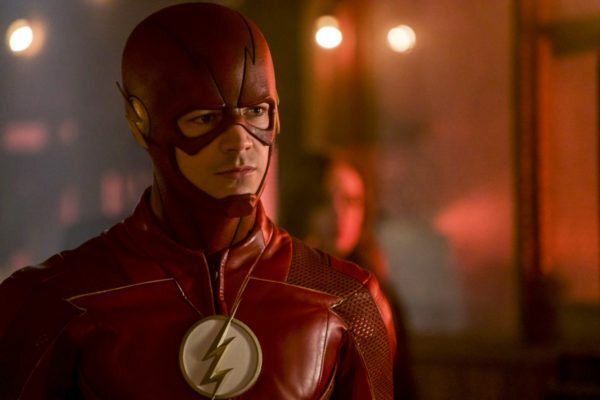 The Flash: “Harry and The Harrisons"
With DeVoe moving closer to his goal of launching satellites that will reset everyone on the planet’s brain looming closer, the threat is very real for Team Flash. But how do you defeat someone who’s original power was to outthink you. DeVoe is literally unstoppable because he already knows you move before you do. As seen throughout the season, he’s out-thought Barry every step of the way. No matter what they do, they have always been one step behind. Adding to the fact that he has orchestrated to have powers from the bus metahumans, there’s almost no way to stop him from launching his plan. The main goal is to stop DeVoe from launching the satellites into orbit that would cover the globe in dark matter and trigger the devolution of the planet. But since DeVoe has the powers of Kilg%re to control technology, they cannot launch any technology that would take the satellites down. Harry cannot think of a way to stop him since his intelligence is fading. Cisco cannot breach outside of the Earth’s atmosphere. They have to figure out a non-technical way of launching objects to attack the satellites. There’s only one way to do it, which would mean making a deal with the devil. 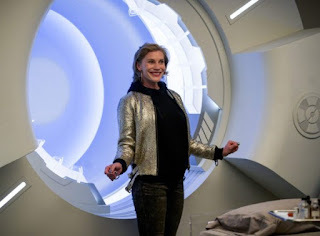 The only metahuman who has the ability to have a non-technical attack built into their powers would be Amunet Black (once again, Katee Sackhoff enjoying the hell out of this role). Able to telekinetically control a rare metal, she could use her powers to destroy the satellites. Of course, Amunet is a criminal mastermind who ruled some of Central City’s underworld in the trafficking of metahumans to the highest bidder. She tried to sell Barry (before knowing he was The Flash as she finds out this week), as well as countless others. However, they are desperate to stop DeVoe. First, they have to find out where she is, as she’s gone into hiding. After finding out her secret identity, they discover that she’s running an underground gambling operation and they need to recruit her to join their cause. Team Flash as worked with Killer Frost as well as with Captain Cold, so they could work with Amunet Black as well. Caitlin secretly needs her help as well. When she was Killer Frost and in Amunet’s employment, Amunet used a secret splicer that could seemingly stop (and hopefully bring about) her Killer Frost persona. Caitlin keeps this a secret from the team as that’s her main goal. Knowing it’s in her best interest to not become devolved, Amunet agrees to help Team Flash, but she first needs their help. Her stash of the metallic rock she is able to control has been stolen from storage. Amunet’s former partner Norvock has stolen the metal in the hopes of selling it to the highest bidder. Meanwhile, Harrison and Cisco has called upon the “Council of Wells” to help him regain his intelligence. However, the council is not too eager to help as they now think that Harrison is not intelligent and the council was formed for the purpose of sharing intelligence. Harrison is no longer intelligent, and therefore, kicked out of the group. 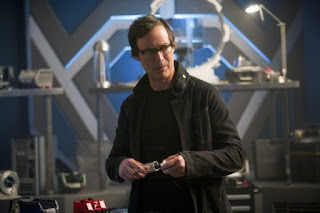 Cisco decides to start up a new council, the “Council of Harrisons.” This group consists of more versions of Harrison Wells, these ones are “emotionally intelligent.” This gives actor Tom Cavanagh a chance to flex his comedic muscle for another episode as he plays various alternate earth versions of himself. Instead of getting him to regain intelligence, the group focuses on Harrison to focus on empathy as a means to defeating DeVoe. Trying to empathize with DeVoe, Harrison realizes that DeVoe hasn’t activated the device because he needs one thing: his wife Marlize, who we know has left him. It’s going to be about turning her to stop him. Team Flash finds Norvock in the middle of making a deal with crime bosses to sell Amunet’s metal. While they are able to stop them (and get Amunet to not kill Norvock, although she kills his eye snake), Amunet goes back on the deal. Caitlin pleads with her to think about more than herself, so Amunet leaves Team Flash with a parting gift, a metallic shard bomb. She also reveals to Caitlin that the splicer she gave her was a placebo, meaning there’s no pharmaceutical means to help her bring Killer Frost back, it’s something she has to do herself. They now have to take the fight to DeVoe to stop him. With Oliver being acquitted last week, all of Team Arrow and the Outsiders seemed to think all is well. Unfortunately, Diaz is still running the city. He had a carefully laid out plan for taking Oliver down without him being a martyr. Since he couldn’t be taken down via legal means, Diaz has to take him down via the street. And it’s not just the vigilantes in his crosshairs now, he goes for them and their families. 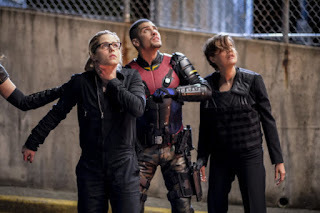 The episode opens with each member going through their normal routines with family: Oliver is with his son and Felicity, Diggle is with Lyla at the hospital checking on his arm, Curtis is on a date with his boyfriend, Renee is watching hockey with his daughter, and Dinah is off doing some vigilante work. All of them are ambushed at the same time by Diaz’s men. They are sparing no one as bullets are flying everywhere. Oliver was warned by Anatoly at the last minute which changes the outcome as he warns everyone, which and allows them to stop their would-be assassins. It’s not over yet for them though. Oliver gets William to an ARGUS safe house for protection and the rest of Team Arrow goes to the Outsiders’ hideout at the old Helix headquarters. It’s a good thing they did that, because Diaz sent some of his men to the Arrow Cave as they torch it. Realizing they are hopelessly outnumbered, there’s nowhere they can go that Diaz won’t find him. Plus, Diaz is safely in a police station, and probably won’t come out. 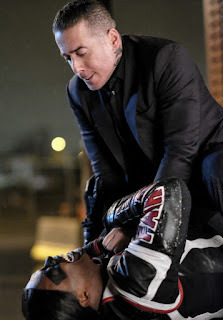 Oliver asks the team to trust him (that’s a big ask considering this season’s events) as he continues to work with Anatoly to spring a trap for Diaz. Anatoly does just that and convinces Diaz that his best course of action would be to flee to another more secure location. He tips Oliver off to the location for all the vigilantes to spring a trap for him. As they ambush his caravan, they almost get away with it. Curtis gets the drop on him, but overcome with emotion since his boyfriend was shot in the first ambush, Diaz gets the drop on him and stabs him to escape. They realize that Diaz had dropped a flash drive in his scuffle with Curtis, and recovering that was more important than finishing the job. The flash drive must be important and Team Flash figures out that they need to get the drive. Felicity as Overwatch, realizes that the flash drive contains all his financial records. If they gained access to it, they could know (and expose) everyone on his payroll and get a chance to take the city back. Diaz has since then gone back to the police station under the protection of the whole department. Diaz starts to suspect that Anatoly is the one who snitched to Oliver. However, Anatoly hasn’t lasted this long not to know how to talk himself out of a situation. He manages to shift blame from himself to the other member of The Quadrant as she showed up out of nowhere to pull Diaz out of trouble, which causes Diaz to kill her. He, later on, meets with other members of The Quadrant and basically tells them to “bend the knee” to him or suffer her fate. Only one remains. Diaz went from being one of Cayden James’s “henchmen,” to running the city, to now being one of two people in charge of all criminal activity across the country. In order to get what’s on the drive, Team Arrow will need to take a serious gamble. Lyla as a member of ARGUS will head to the police station on “official” business, looking for Diaz (since the police have to keep up a presence they are an actual police force), and place a device that will sniff out the flash drive and clone it. Felicity sits nearby in a van to pick up the signal and clone the device. However, Diaz has his own techie, who figures out what they are doing. Lyla is cornered, forcing Team Arrow to come and save her. Felicity also goes in to try and get the device to continue the cloning. Diaz almost gets the drop on her but is saved by Oliver last minute. Since they have the cloned device, Diaz is able to track them down to the Helix headquarters, where he launches an all-out assault on Team Arrow. He gasses the place as well. Team Arrow is able to escape, and Oliver blows up the headquarters, narrowly escaping death at the hands of Diaz. Felicity is forced to abandon the drive so that she and Oliver can escape alive. Oliver has only one more card to play. 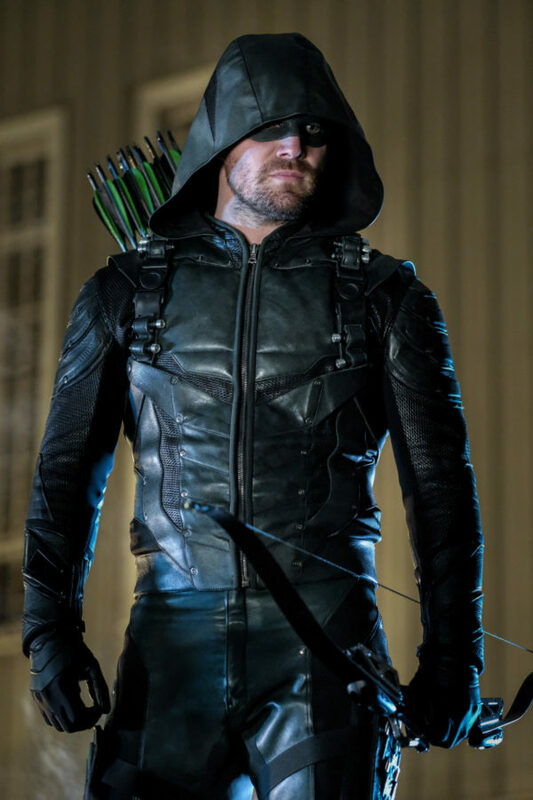 He approached the FBI agent who was investigating him for being the Green Arrow for help. She forced him to reveal who he truly is in the hopes that she will get the agency involved to stop Diaz. Next week is the season finale as Team Arrow takes on Diaz in the final showdown!